how do you get a galactical dragon with traits ? Only way to get them is from the Galaxy Mystery Eggs when they are in the Rift Market. At least they follow the 'rule' of: Normal, Twin, Twin Rift, if you get duplicates. 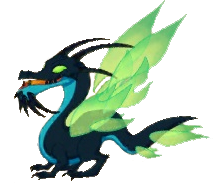 Please note, you CANNOT breed Rift Galaxies in the Rift as Galaxy dragons can only breed in the co-op cave. what`s that for a rule ? I know it was mentionned with the gifted eggs during the winter saga too, but wasn`t aware that it is an overall rule. It seems mystery eggs give a normal dragon (if you don't own one already), or a twin (if you have a regular version), or a rifted twin (if you already have a twin). There are some things which don't follow this (ie ghostly dragons which can't be rifted AFAIK). Sorry I think I got a little carried away.